The first time I read this series I actually didn't make it to end the first chapter. In part it was because at the time I was too obsessed with Bleach to actually care for another shounen series, in part it was because in less than 10 pages, Hiruma managed to scare the hell out of me. His appearence, half-hidden behind a corner, fangy grin, evil laugh and psyco glint in his eyes made me think "why the hell am I reading this?!". Then, many months later, I was in a sever lack of reading material and a corner of my mind just had to point out that I still had to read Eyeshied 21...well, in three days I read something like 25 volumes. The story revolves around Sena Kobayakawa, a freshmen in Deimon High School with a quite and overpolite personality who's always been easily picked on and exploited by the stronger school-mates as an errand boy because of his gentle attitude. As he's always been seen as a weak and spineless person, he doesn't know to be quite gifted in running mostly because of the errand jobs that were forced on him and helped him to train him without Sena realizing it himself. At the very beginning of the series he's forced into joining his high school American football club by the captain of the team, Youichi Hiruma, who, upon learning about his running skills, realizes the boy's full potential and is willing not to let this chance slip his hands. Being the gentle and easily-scared boy that he is, Sena is less than willing to partecipate in what he deems to be a very dangerous sport, but he's to frightened by Hiruma to actually complain or refuse to play. As the series proceed new members join to club and Sena himself develop to the point of playing American football for the simple love of it. 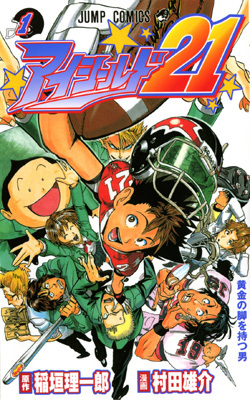 One of the most appealing characteristic of Eyeshield 21 is the abudance of well-developped characters: usually when a series is very long and has too many characters in it, the authors mostly end up forgetting about some of them, not developping them at all or just repeating the same traits over and over again. In Eyeshield 21 every character has their own peculiarity and reason to exist. The whole story was so well-planned that characters that become relevant to the plot only later in the series, are actually presented starting from the first volumes. Another trait of the series are the hilarious situations, the general tendency to degenerate into ridiculous, and the cunny and sarcastic comebacks from Hiruma, that take away nothing from the serious moments. Everything is laced together in smooth flow of events that keeps you on the edge and makes you wonder what is going to come next.